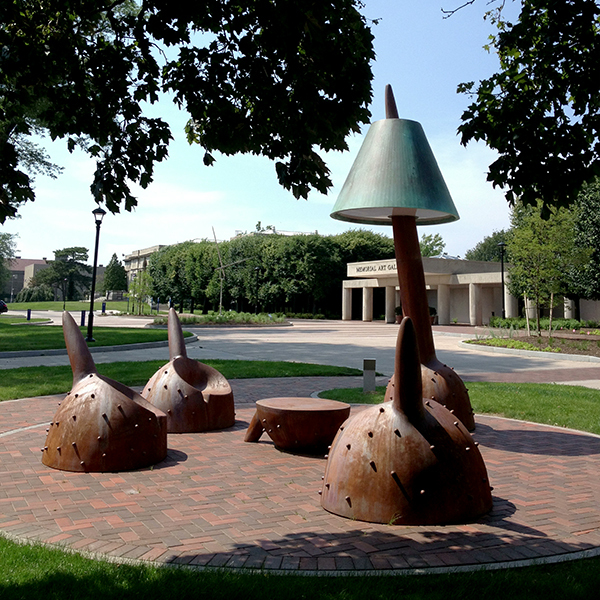 Rochester’s own Wendell Castle’s piece provides an outdoor grouping of chairs, a table, and a lamp for visitors who would like to spend some time enjoying the passing scene. The Memorial Art Gallery commissioned this monumental cast-iron sculpture by Castle as one of the anchor installations of its Centennial Sculpture Park. The piece, Unicorn Family measures 22 feet in diameter and consists of a gathering area with a table and three chairs and a 13-foot LED lamp. Wendell Castle is an American furniture artist and a leading figure in American craft. He is often credited with being the father of the art furniture movement. His bold and graceful pieces, often organic, and sometimes whimsical, are crafted from rare and beautiful hardwoods, plastics, veneers, and metals in a timeless contemporary style. His expression of color and exotic materials are synonymous with the Wendell Castle name.